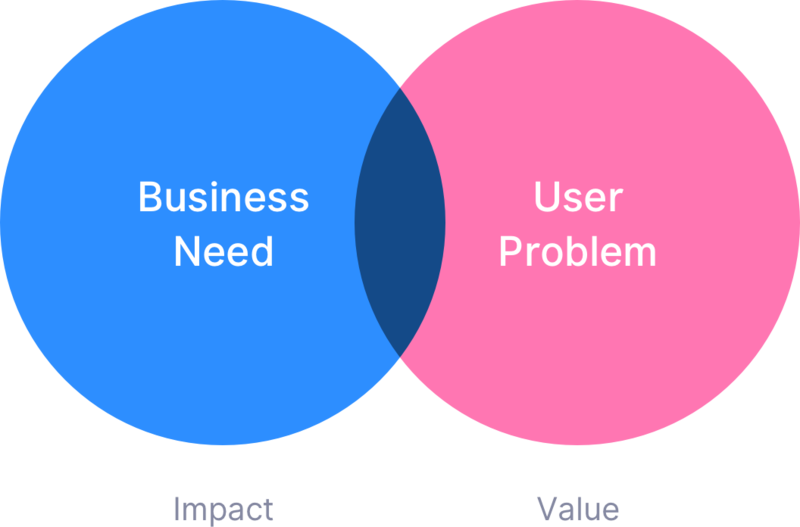 Problem Framing is the first step to creating products customers love. When building products, the first question we should ask is: What problem are we working on? From our experience on many occasions, the answers revolve around the solutions rather than the actual problem. Through problem framing we can spend a day helping our clients (and ourselves, too) understand and align around a big, important problem worth solving before jumping into the other phases of our product development process. Generally solutions are easier to talk about. They’re linear. But when starting a new project with the teams and companies that approach us we want to be on the same page – and solutions also generally don’t invite new thinking or curiosity. Hence before kick-starting a project, we suggest focussing on understanding and prioritizing the problem first. This sets us up for building the right solution, to the right problem. Product discovery means looking for a sweet spot. Both your business and your users need to buy into the product – the business mainly benefits from the impact the product has and all needs of your business should be considered. Does the problem we’re trying to solve map to the strategic goals of our company? Next, we also need to consider the user: What problems does the user have? The space inbetween is where we should focus: User Problems that you are excited about and capable of solving. From our experiences while working with startups, mid-growth companies and enterprises we have collected different activities that can be done within a day or two, to understand more about the problem we should be solving. A discovery workshop is the ideal start for any major project – it helps getting to know your business, your customers and setting us up for the later stages of the product development process. The workshop will ideally be run on-site on a 1 to 2 day schedule that brings in Product Design experts from Fintory and your stakeholders and their team.